workshop in Schwarzenback Germany in 1810 taking Anton Hofmeier into partnership in 1850. 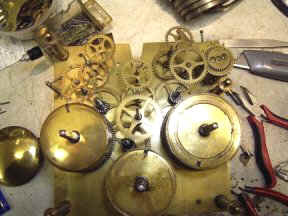 These movements were extremely well made and that's just one reason why their clocks are very much sort after today, and well worth restoring. 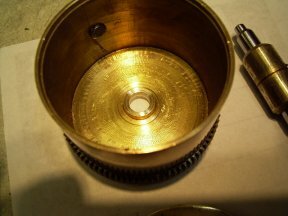 the ratchet wheel bracket was to long and was touching the barrel acting as a brake, you can see below the groove it has cut in the barrel, no wonder the chime was slow!! The wear on this barrel was excessive causing it to lean over and "jam up" stopping the clock.